The original recipe for the crazy cookies known as Enuff Z'Nuff? Piece of cake really. Get into the kitchen and grab me the following ingredients: The Beatles, Elvis Costello, Cheap Trick. Mix it all together in the blender, add the healthy dose of Glam and you'll usually end up with something sticky and sweet. 'Diamond Boy', no longer follow the original recipe though and the "NEW" cookies are perhaps just lacking a little bit of the great flavour and taste of the heydays. The band now centered around bass player and vocalist Chip Z'nuff, still alive, out there, touring and recording new material. 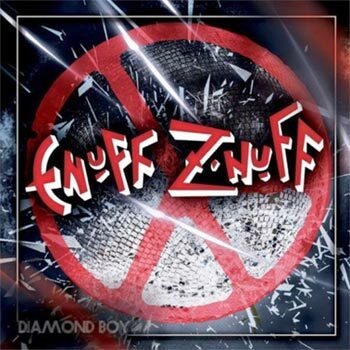 This record is the first Enuff Z'nuff release where Chip handles all of the vocal duties, "Singing on the entire album was very challenging. I'm taking the place of my brother (Donnie Vie) who I consider one of the greatest singers of our generation", says Chip. Yours truly. The nineties fan of the original cookies and grew up with the power-pop music. I knew absolutely nothing about acts such as The Beatles, Elvis Costello, Cheap Trick, and it took me forever to discover their influences. People say that Donnie mimic and copied Lennon. But there's a whole lotta Costello in that voice too. Chip is no Donnie, and no schmuck for that matter. The echo voice effect works magic in the studio. I quite like it. It's old school. A bit rough around the edges but still worthy of your attention. Let me tell you another thing. This is the typical grower album and you need to spin Diamond Boy on his head several times before the drugs kick in. In fact. The song material grew with each spin up to a certain point of course. It's not like they're still growing.